Cerastium vulgatum plant. Photo by Richard Old. www.xidservives.co. anpc.ab.ca (Accessed 12/017). 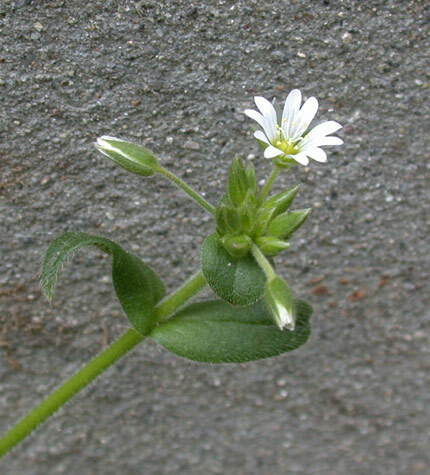 Cerastium vulgatum is a short-lived perennial, 15-50 cm long from fibrous roots, stems sprawling, hairy, slightly sticky, rooting at nodes, with short, matted basal branches. 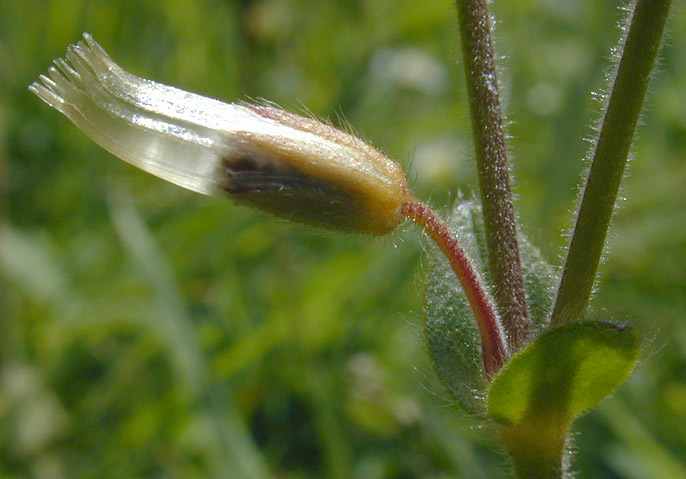 Cerastium vulgatum flower. Randall G. Prostak, University of Massachusetts. extention.umass.edu (Accessed 12/2017). Leaves opposite, stalkless (sessile), blade 1-2 cm long, 0.3-1.2 cm wide, stem leaves egg-shaped, lower leaves spatula-shaped, hairy, dark green. 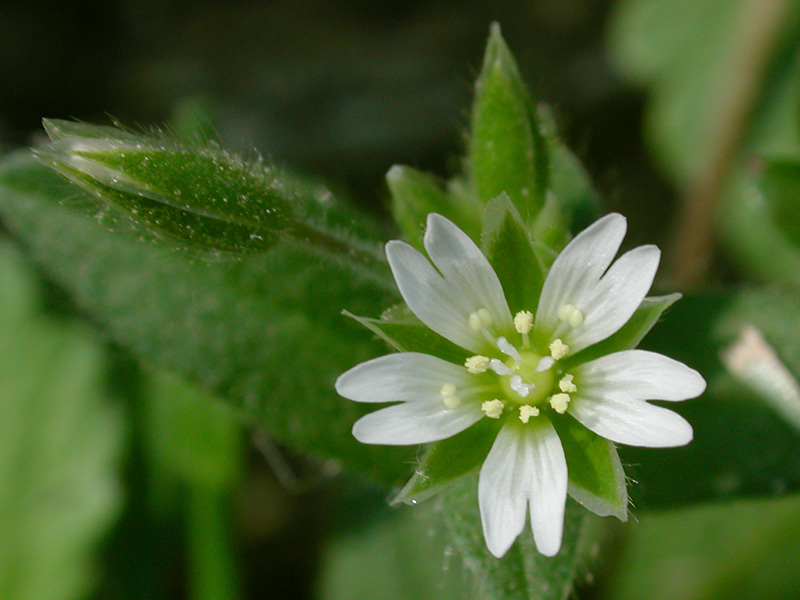 Cerastium fontanum flower. David G. Smith. Delaware Wildflowers. discoverlife.org (Accessed 12/2017). Flowers white, to 0.6 cm wide, petals 5, deeply 2-lobed, to 0.1 cm long or longer, about same length as sepals, sepals 0.5-0.6 cm long; flowers self-fertile (autogamous), (Mulligan and Kevan 1973); inflorescence terminal, becoming widely branched; blooming and fruiting early spring to late autumn (Uva et al. 1997). Cerastium fontanum fruit. Copyright © Malcolm Storey, 2001. Creative commons- Attribution-nonCommercial-ShareAlike 2.0 UK. www.bioimages.org.uk (Accessed 1/2018). Fruit dry, a cylindrical capsule 0.6-1 cm long, 0.2 cm wide, tip opening by 10 linear teeth to release numerous, warty brownish seeds. 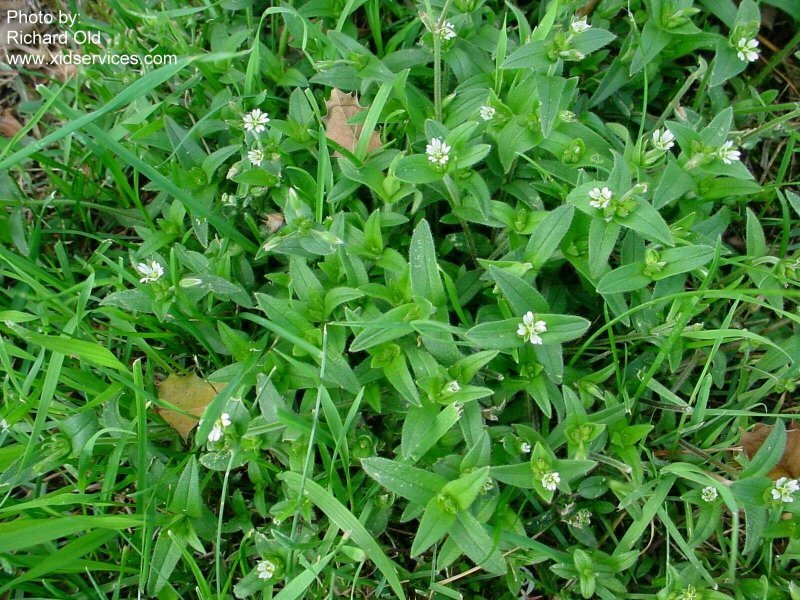 Habitat: Common weed of open areas, roadsides, lawns, gardens. Notes: Somewhat shade tolerant, intolerant of drought, often green through winter (Uva et al. 1997).